What better book to end this series of Christmas stories than the collected letters of Father Christmas? They were written between 1920 and 1943 to the children of J. R. R. Tolkien. 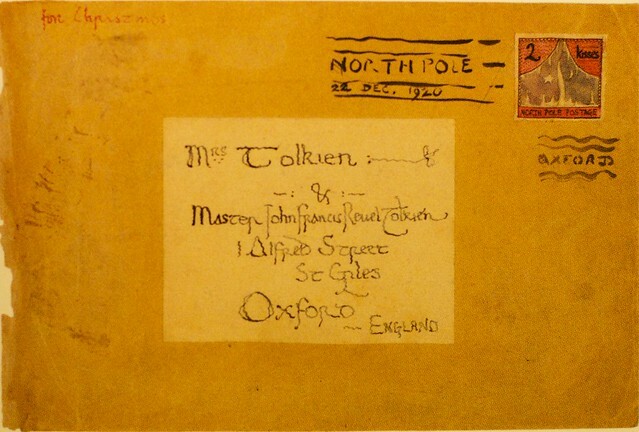 The letters were collected by Tolkien's daughter-in law and published in a beautifully illustrated volume, containing both facsimiles of most of the letters and the images drawn to accompany them. The very first letter was written to Tolkien's oldest child, John, when he was just three years old. 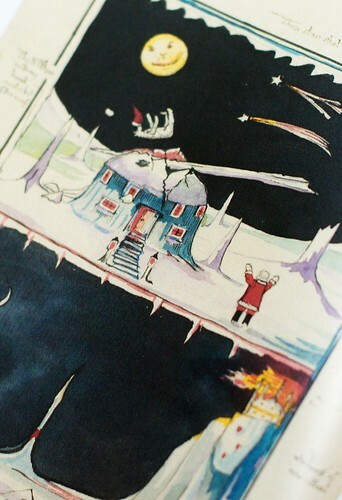 It was a short note accompanying a drawing of Father Christmas and his house, as the boy had asked what it looked like where Father Christmas lived. As time progressed, however, the letters grew longer and the stories more involved, detailing life at the North Pole. The 1925 letter introduces the North Polar Bear, whose antics will keep introducing drama in the letters throughout. This year, he has climbed up the North Pole (which is an actual pole) in order to fetch Santa's hat, and in the process breaking the Pole and Santa's house (which he falls down on). 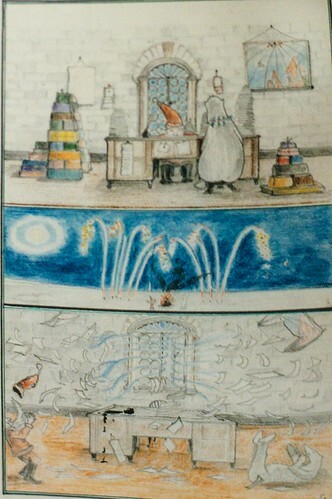 The following year he sets off two years' worth of Northern Lights (Rory Bory Aylis fireworks), breaking the moon apart so the Man in the Moon falls into their garden. 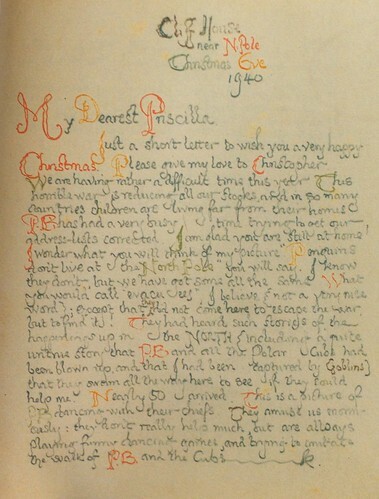 Letter and illustration from Christmas 1940. 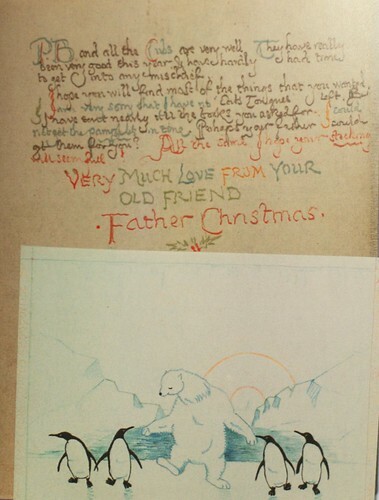 The North Polar Bear also writes his own letters, or joins in with commentaries on Father Christmas' (and we later learn that his real name is Karhu -- which I seem to remember is Finnish for "bear"). There is also a Snow Man (the gardener) who always writes in white, who in 1927 gets pushed over a cliff by the North Polar Bear (and in a macabre twist, Father Christmas uses what is left of him to paint a picture to send to the children). The cast expands: In 1929, the Snow-elves set of all the Bonfire night rockets at once, and the North Polar Bear goes off to live with a wood-cutter called Olaf in Norway (but not before opening a door to the wind and thereby putting all the lists in disarray. And 1931 introduces the North Polar Bear's nephews Paksu and Valkotukka (again, Finnish, meaning "fat" and "whitehaired"). In 1932 they were sent a teaser letter early in November indicating that the North Polar Bear had disappeared, followed by a lengthy Christmas letter relating the subsequent adventures in the caves of the Cave Bear: The goblins are introduced. It is hard not to see them in connection with the Nazis already at this point, when "the Goblins shut off all the lights, and made queer noises and false echoes ... We thought there were none left. Long ago we had great trouble with them." But I may be reading that retroactively based on their rôle later in the narrative. The goblins love mechanical toys in particular (though they quickly break them and then want more), and steal toys from Father Christmas' stores. The goblins also attack the following year, and while they are beaten back, there are intimations in 1935 that they are massing their forces. In 1937, incidentally, there appears an Elvish secretary to Father Christmas whose name is Ilbereth, and I cannot help seeing the link to The Lord of the Rings and Elbereth. And there is also a reference to the publication of The Hobbit. And in 1938 there is a long poem with incorporated criticism of the rhyming skills displayed. While Father Christmas references "the war" from 1939 onwards, and in 1940 penguins swim all the way from the South to the North Pole in order to help in the effort against the goblins (though they seem to spend most of their time dancing), the goblins themselves only return in force in 1941. They stage a surprise attack on the North Pole, in the millions, but after a dreadful siege, they are beaten back by Polar Bear and Father Christmas' allies. In the (surprisingly violent) battle, however, the North Pole falls down for the second time (though the important thing is that the North Pole does not fall). Jeg burde nok lese denne, og flere andre av Tolkiens mindre kjente verker. Jeg har pløyd gjennom en stabel med litt lettvint fantasy i det siste, og føler et behov for noe med mer substans, og jeg ser for meg at Tolkien kan levere.